Visiting a college campus, spending time with people who are part of the community and seeing for yourself what a college is all about are key ways to determine your fit. For your convenience, Dickinson offers a variety of ways for you to visit that will enable you to experience our vibrant campus community. High school juniors and their families are invited to spend a spring Saturday at Dickinson! This visit, designed specifically for high school juniors, will give students and families a chance to learn more about the distinctive nature of the Dickinson experience through the stories and experiences of staff and students, while also learning more about the admissions process through optional workshops and presentations led by Dickinson’s admissions staff. Designed for first-time visitors, this ideal introductory look at Dickinson features a welcome, a tour of our historic campus and an opportunity to learn more about the admissions and financial-aid processes. Come learn more about the distinctiveness of the Dickinson experience. To confirm availability, please call us at 800-644-1773 or register online. Information Sessions are offered every weekday in the summer and spring semester and on Mondays, Tuesdays, and Fridays throughout the fall semester. They are conducted by admissions staff members and provide an excellent opportunity to learn about everything from the college's distinctive mission to the "nuts and bolts" of the admissions process. To confirm availability and schedule an information session in advance, please call us at 800-644-1773 or register online. Walk the campus with a member of our Liberty Cap Society and see Dickinson through the eyes of a current student. Tour highlights include: academic buildings, a residence hall and campus facilities like the Holland Union Building (student center), the Kline Center (athletics facilities) and the Waidner-Spahr Library. To confirm availability and schedule a campus tour in advance, please call 800-644-1773 or register online. Mornings: 9 and 11 a.m. Afternoons: 1 and 3 p.m. Please join the Center for Sustainability Education (CSE) in exploring the nationally recognized sustainability initiatives currently underway by our students, faculty and staff. Led by one of our Green Tour Guides, highlighted information includes the Center for Sustainable Living (aka Treehouse), The Handlebar Bicycle Co-Op, renewable energy production on campus, LEED-certified buildings, and a visit to CSE headquarters. Green Tours are offered during the acacdemic year. To confirm availability and schedule a Green Tour in advance, please call 800-644-1773 or register online. A day visit gives high school seniors the opportunity to experience life as a Dickinson student for the day. Each day-visit itinerary is customized for you. Typically, it will include (but is not limited to) attending classes in an area of academic interest and lunch in the Dining Hall with a current Dickinson student. 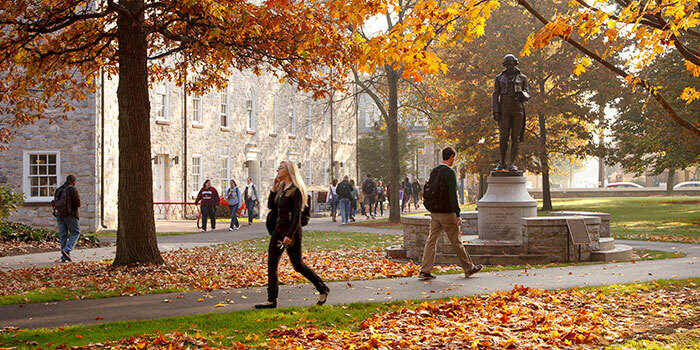 Optional requests may include a campus tour or on-campus interview. The day-visit program is our most popular option for students hoping to explore Dickinson "behind the scenes." Day visits are offered most weekdays from February 14 until April 30. Register online or call 800-644-1773 for more information. Interviewing can help us get to know you and learn more about your personal experiences, goals and aspirations for college; however, participating in an interview is not required for admission to Dickinson. We provide a variety of ways for prospective students to interview, on and off-campus, through Interview Days and individually arranged interviews, usually in person but sometimes via Skype. If you wish to interview, you must do so before your application deadline. On-campus interviews are offered to students starting in April of the junior year in high school. On-campus interviews are available Monday through Friday. To confirm availability and schedule an on-campus interview in advance, please call us at 800-644-1773 or register online. Learn more about our student interviewers. Off-campus interviews are also offered beginning in April of the junior year through the end of January. Look for an Interview Day in your area or request an individual inteview at least three weeks before your application deadline. To confirm availability and schedule an individual off-campus interview, please use our online form or call 800-644-1773. Our spring Saturday visits are offered March 30, April 6 and April 20. These visits include a 10:15 a.m. information session and an 11 a.m. tour. To confirm availability and schedule a Saturday Visit in advance, please call 800-644-1773 or register online.